Wharfedale Diamond 220 HCP review | What Hi-Fi? We love the Wharfedale Diamond 220s, and we’re not shy about saying so. As if giving them an Award wasn’t enough, we have previously used language such as ‘best-sounding budget speakers on the market’. So imagine our excitement when we learned we would get to try them in a surround package. 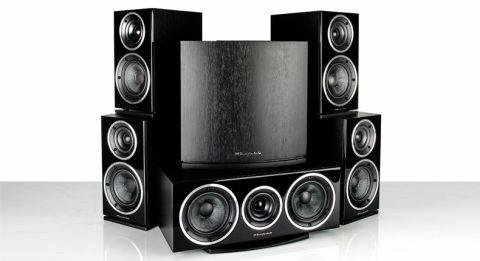 The Wharfedale Diamond 220 HCP (Home Cinema Package) comprises two pairs of Diamond 220 standmounters, a 220C centre speaker, and an SPC-10 active subwoofer – another five-star winner in its own right. The speakers use 25mm tweeters, set in a deeply dished waveguide to improve efficiency, and 13cm woven Kevlar mid/bass drivers. The cabinet is made of particleboard sandwiched between MDF, designed to reduce unwanted distortions from the cabinet. The unusual element here is the ‘slot-loaded distribution port’, a downwards-firing reflex port that opens into a small gap between the base of the cabinet and the plinth. This design helps reduce chuffing noise and makes the speaker less fussy about its proximity to walls. We’re pleased to see this port design has made it to the 220C. This feature was missing in its predecessor the 101C, and we felt there was a mismatch with it and the rest of its package. Put it all together and what you get is a fine sound indeed. It’s big, for starters. The Wharfedales have no problem engulfing you. Watching Birdman, we were so immersed in sound that it was easy to imagine we were backstage in a Manhattan theatre. This is a well-integrated package. The centre speaker no longer sticks out oddly, and the speakers work closely with the subwoofer, which focuses on agility and detail over rearranging your organs. Effects pan across the room in a tightly-knit soundfield, maintaining a consistency of character as they go. It’s an analytical listen, offering plenty in the way of precision and fine detail. Voices are solid and insightful, there is a high level of clarity and the timing is tight. That’s not to say they’re not capable of fun: the sound packs a good deal of punch, handling dynamic shifts with confidence. Take care when setting up the speakers. The design may have been intended to make them less fussy about placement, but we find they actually perform best when placed close to walls. Do this and you’ll be rewarded with a more solid, precise stereo image. It’s also worth tinkering with your amplifier’s output levels. On our auto-calibrated settings, we initially found the sound a little clinical. Going into the settings and turning the centre speaker down one decibel or so resulted in a livelier, more atmospheric sound. They succeeded as stereo standmounters, and now they’ve succeeded as a surround package. Is there anything the Wharfedale Diamond 220s can’t do? Maybe, but this package is an excellent way into the world of surround sound and at budget price too.